Baku residents enjoyed another spectacular evening of mugham music, organized TV channel "M?d?niyy?t"(Culture) and International Mugham Center. Famous mugham singer Sevinj Sariyeva brilliantly performed mugham modes, including "Segyakh", " Mahur tasnif ", "Dilkesh tasnif", Haji Khanmammadov's work "Telli" and the Turkish folk song "Gül a?ac?" (Flower tree), Trend Life reported. Her performance was accompanied by the instrumental ensemble "Buta", whose artistic director is tar musician Rovshan Gurbanov. The ensemble includes the honored artist Tarana Aliyeva (kanun), Jeykhun Muradov (kamancha), Kamran Novruzov (tar), Soltan Aliyev (naghara). The concert aroused great interest among spectators. Sevindj Sariyeva conquered the audience with flawless performance. 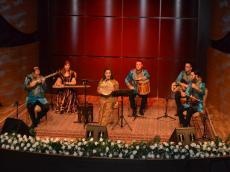 A series of concerts devoted to the Azerbaijani mugham modes (Rast, Shur, Segah, Chahargyah, Bayati-Shiraz, Shushter, Humayun) kicked off from May 30 to June 30. In the new season, which began on October 11, there are evenings devoted to various areas of mugham music-"Mahur-Hindi", "Bayati-Kurd", "Orta Mahur", "Rahab" and other. Notably, a concert devoted to mugham modes "Ovshari" and " Arazbari" will be held on December 27. The Azerbaijani mugam is included in the list of UNESCO Masterpieces of the Oral and Intangible Heritage of Humanity (2003) and the Representative List of the Intangible Cultural Heritage of Humanity (2008). Media partners of the event are Trend.az, Day.az, Milli.az, Azernews.az, "Baku" Magazine.